Hi, welcome to use TH10/ TH16! Sonoff TH10/TH16 can monitor real-time temperature and humidity through eWeLink. There are two power supply specifications: 10A or 16A. It supports presetting a temperature or humidity range to auto-turn on/off connected device. It also supports Smart Scene. There are two devices to choose：10A or 16A. * Please make sure you have read and follow the L, N, E print on the enclosure. Compare with the old version, the new version has a different layout. 1. Plug your sensor into the jack, power up your device. 2. Press the button for 7 seconds until the green LED blinks like this: blinks 3 times and on repeatedly . 3. Please click the “Add” icon on eWeLink to search device. 5. 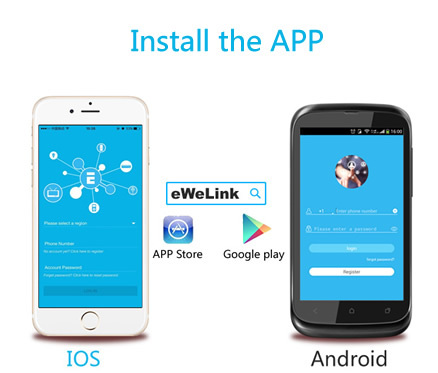 Next, the device will be registered by eWelink and added it to your account. It takes 1-3 minutes. 7. Maybe the device is “Offline” on eWeLink, for the device needs 1 minute to connect to your router and server. When the green LED on, the device is “Online”. If eWeLink shows still “Offline”, please restart eWeLink. 1. WiFi remote control and device state, temperature and humidity checking. Turn on/off by tapping on device icon. If you use the Sonoff TH with temperature and humidity sensor, device state and real-time temperature and humidity values will simultaneously display on the interface. In Auto mode, you can set a specified temperature or humidity range to turn on/off connected device. In Manual mode, you can tap on the device icon to turn on/off. 5.1 In Auto mode, the switch can not be turned ON/OFF by the button manually. 5.2 In Manual mode, the switch can be turned ON/OFF at any time. 5.3 The preset timers can work as usual in Auto mode. 6. Insert sensor to start device or not. 6.1 Insert sensor: APP will display temperature and humidity values, and it can be set to Auto mode. 6.2 Without sensor: APP will not display temperature and humidity value, and it does not have Auto mode. You can use Sonoff TH to collect temperature value and set a temperature to turn on/off several types of other switches (such as Sonoff, Sonoff RF). Note: the Sonoff TH should in manual mode, not auto mode. When the real-time temperature is across the preset temperature range, it will trigger the condition. It will auto-remind you of new firmware or version. Please update as soon as you can so that you can use the latest features. 1. My device has been added successfully but stays “Offline”. 1.1. Green led quickly blinks one time and repeats: It means the device failed to connect to the router. The reason may be you have entered wrong WiFi password or your device is too far away from the router, which causes a weak WiFi signal. The device can not be added to the 5G-wifi-router, only the 2.4G-wifi is compatible. At last, make sure that your router is MAC-open. 4. The green led keeps off, even if the device is powered on. Pressed the button but the device does not work. Answers: The circuit may be broken, please send it back for testing. Return shipping postage and packaging will be at buyer’s expense, if the device is damaged by the buyer, and so the buyer should bear extra repair cost.